One of my main purposes of this site is to unite people of all faiths into a common ground of understanding through uplifiting dialogue online. I feel that slowly and surely we’re all beginning to come together as people of faith. One example of this is the recent forum at Notre Dame entitled “Conviction and Compromise: Being a Person of Faith in a Liberal Democracy”. At this forum, they had a few Christian leaders from various denominations,including: Rev. 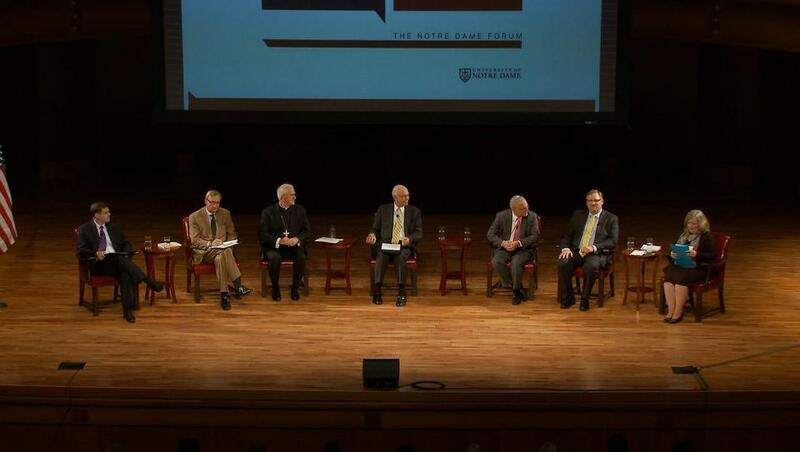 Joseph E. Kurtz, archbishop of Louisville; Rabbi David Saperstein, director and counsel of the Religious Action Center of Reform Judaism; Rick Warren, founding pastor, Saddleback Church, Lake Forest, California; and Rev. Richard Cizik, president of the New Evangelical Partnership for the Common Good, and a Mormon apostle (Dallin Oaks, pictured in the middle). The discussion surrounded the role religion should play in our political decisions. I thought it would be interesting to see how readers of this blog feel about the issue and thought we could have a panel of our own. I will share the questions asked at the forum to each of the religious leaders. When you leave a comment, share with us your religious affiliation and then answer the questions. How can people of faith reconcile religious conviction with politics, which is often described as the “art of compromise”? Should voters take a candidate’s religion into account when casting their ballot? How should elected officials apply their faith when making policy? How does religious diversity affect our national understanding of religion’s role in both politics and government? 1) How can people of faith reconcile religious conviction with politics, which is often described as the “art of compromise”? This is a false dilemma. The statement implies that a person of faith either abandons his faith to solve a problem equitably or remains true to his faith and solves nothing. Faith is a part of one’s being. In most cases, it is possible to reach an equitable solution without compromising one’s faith. 2) Should voters take a candidate’s religion into account when casting their ballot? Another bogus question. A competent voter will take ALL facts about a candidate into consideration, including religion; if you are leery about the religion but like his stance on the issues, you might overcome this anxiety to vote for him. If people knew the extent of Barak’s involvement with Marxist theory and his choice to join the Trinity Church, which preaches radical, left-wing liberation theology, which openly endorses “redistribution of wealth” and expressed hatred for imperialist, white America, they might have put these facts together to determine that Barak truly did intend to bankrupt America, transforming it from a superpower to an inferior nation among other inferior nations. 3) How should elected officials apply their faith when making policy? See answer #1. Will a politician vote against conscience or the will of the people? A good official will act according to his ideals, in accordance with the constitution, the law of the land and the good of the people. The decision might be at the edge of what he can tolerate and at the edge of what the people will tolerate; but when done according to one’s conscience and for the good of the people and according to the laws of the land, the official should be able to rest with his decision. He will go down in history as a man of noble quality. 4) How does religious diversity affect our national understanding of religion’s role in both politics and government? Diversity is not an issue of policy or polity, it’s a fact of life. From the beginning of our Republic, people of diverse nationality, ethnicity, races and religion have been involved with politics and government. The business of good government is governing: wisely and equally. If a person is elected or appointed to an office, he serves to the best of his ability and according to the law of the land. Religion is merely a characteristic of the person and ideally should not be a matter of concern. The workplace (and government) will have people who ascribe to any one of a wide range of religious faith and practice. To one degree or another a person’s religion will manifest itself in the workplace. Fellow workers should show some tolerance of a person’s religion and not be so rigid as to insist that all vestiges of religion be kept out of the place of work. On the other hand, if a religious component interferes with the person’s work or causes trouble in the workplace, and becomes the basis for continuing in his office or not, the person has to choose between doing his work or keeping his religion. Many a person has had to make this choice of conscience or keeping his job. I like a lot of what you said. It was right on. I like what you said about not just focusing on the religion of a person, but all facets of the person, including the religion. Question for you regarding focusing on religion: I’ve heard many Christians who are luke warm if not cold on voting for Romney due to his religion. Have you seen this? If so, how do you respond to those who do not vote for him due to his religion. Technically, Obama is a Christian because he went to a Christian church and has said he believes in Jesus, right? So why not vote for him if one is a Christian? You said question 1 is bogus, and I can see why you said that. I think too many people think that being religious means we have to wear it on our sleeve and be preaching all the time and praising Jesus with every other sentence. I feel that a good Christian quietly goes about doing good, like Jesus did for the most part. A politician can and should be religious and I feel that those who are, the Lord blesses. I like a lot of what Ezra said. When Jesus walked the earth, he played down the fact that he was the Son of God. Scholars have said that this was because the persecution that would have been stirred up would have hindered his ministry. Whatever the reason, I think it demonstrates that it can be okay for politicians like Romney to play down some of their views. I also think that Romney can refuse to answer some of the press’s questions—as he does— without compromising his faith and his honesty. They should do what God tells them to do. That question is too heavy for me right now! You asked about Christians being lukewarm for Romney. I really don’t know of any Christians who are lukewarm for Romney. Right now most are concerned with the “transformation” that Obama has planned for America. People are finally figuring out that this means that he is intent on gutting America of its individuality and private industry and replacing it with government-organized business. Unions have been pumped up with stimulus money and special advantages in the marketplace, edging out individuals who want to run their own business. Regulations and onerous taxes (including the Obamacare Tax) is killing small businesses–as Obama wants. (Private and Individualism are words that are anathema to Socialists.) Because he and all liberals LOATHE personal freedoms that are guaranteed under the Bill of Rights for citizens, he is transforming the Bill of Rights to be a social compact of rights for government freedoms. Anyway, Obama is a run-way bus waiting for a wreck. We need that tyrant out from behind the wheel. Romney is the only viable choice. We pray that he stays the course and retains the values at the root of his faith: hard work, personal choice and individual freedoms. This is very good to hear. I just joined a non-profit Christian organization called United in Purpose. It is an organization that has an initiative called “Champion the Vote”. They say there are about 60 million Christians in the nation and only 30 million vote each cycle. If we can get Christians out and vote, we can determine the outcome of the election. I encourage you to join and to volunteer to spread the word to as many Christians as you can so we can get back on track and have a leader who tries to follow and worship God rather than worship himself. You don’t pull many punches. Building on what you wrote, I’d clarify that President Obama isn’t really gutting the Bill of Rights. It is championed, for instance, when it is needed–freedom of expression for demonstrators (like anarchists), freedom of religion (for Muslims who want to break for prayer at their dictate, over an employer’s right to run a business); but it is also eclipsed, as for the unknown Coptic Christian who is Obama’s straw dog for “causing” riots to happen in the Mideast (where the unprotected US ambassador is tortured, sodomized, and killed on the anniversary of 9-11) and who is arrested under some unrelated charge but obviously in retaliation for the trailer video of a spoof on Islam. So much for free speech, huh? No, as with everything, the President is simply overlaying everything with a system he prefers. It’s easier to encapsulate the system you don’t like (the legislature, judiciary, the constitution, the Bill of Rights) and construct a system that circumvents all of that: Czars in a level above current cabinets and policy-wonks who can make laws and execute them at will, by fiat, at Obama’s expressed will. The press has long ago bowed to his majesty and abandoned the work and responsibility of journalism. It must be taught in theory and abandoned in practice. But as for the rest, I agree.